Turkey and Indonesia have good diplomatic relations until today. If we look at the media, there are many Indonesian praising President of Turkey Recep Tayyib Erdogan. Acknowledging that euphoria, Indonesian Students Association in Turkey (PPI Turki) and Indonesian Association in Konya (PPI Konya) conducting international symposium discussing the relations between Indonesia and Turkey at 31st January 2019. This symposium held at Selcuk Universitesi, one of the most recommended university in Turkey located in Konya province. At the opening session there were 3 Indonesian cultural performances, Tari Topeng from Indonesian Students Association in Samsun, Tari Tarek Pukat from Indonesian Students Association in Kayseri and Angklung from Indonesian Students Association in Konya (Indonesian bamboo instrument). Continued with Vice Rector of Selcuk University, Prof. Dr Ahmet Kagan Karabulut's speech. In his speech, he express his gratitude towards this symposium and talked about the good relations between Indonesian Students and Selcuk University. In this symposium there are three speakers. First, charge d'affaires ad interim, Mr. R. Hikmat Moeljawan. He talked about the cooperation between Turkey and Indonesia which was established since 1950. Turkey and Indonesia has bilateral forum in which there are 20 bilateral documents about cooperation in that forum. Moreover, Indonesian National TV station (TVRI) has Memorandum o Understanding (MoU) with Turkey National Television TRT. President of Indonesia Joko Widodo and President of Turkey Recep Tayyip Erdogan had done presidential visit in 2015 and 2017. the Investation of Energy Geotermal Power Plan in Gereudong mountain has reached USD 1 billion. In education sector, Turkey has approximately 1200 students from Indonesia. Furthermore, Marmara Universitesi in Ankara also has cooperation with Hasanudin University in Makassar. In defence sector, both countries have agreement to increase cooperation for defence and security such as Kaplan Tank. Vice Rector of Selcuk University, Prof. Dr Ahmet Kagan Karabulut, Delivering a speech and gratitude for this event. The second speaker, the ambassador of Turkey for Indonesia H.E Prof. Dr. Mahmur Erol Kilic. In his perspective Indonesia is good at preserving its culture and he hopes Turkey and Indonesia can develop a good cooperation in every field. The philosophy of “unity in diversity” which is believed by Indonesia can be a great power. The similarity of religious background between Indonesia and Turkey can be a power for both countries to make a better cooperation. Thus this matter also can be a power to face threats considering both countries have great number of Muslim population. The third speaker, Prof. Murat Cemrek as the Head of International Relations Major of Necmettin Erbakan Universitesi shares his knowledge about Turkey’s foreign policy and education development in Turkey for the last 17 years. In his session he belief that Turkey’s education shall adapt to fast-changing world. 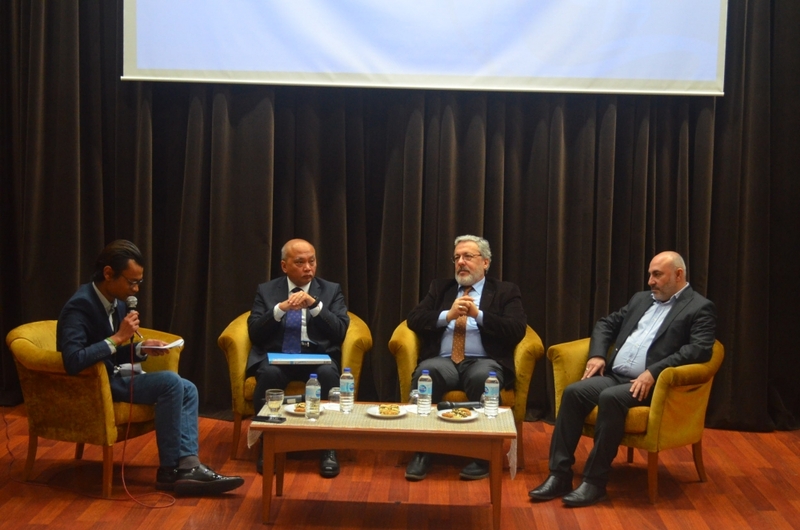 Of the three speakers, they shared the opinion that to become a great nation was not only related to economic figures but the most important thing was the mindset of all its citizens. Especially for Indonesian students studying in Turkey, this is an excellent opportunity to broaden their views on the world and have a better understanding of the situation around them. This symposium marks a good relations between Selcuk University and Indonesian Students Association in Konya, also Turkey and Indonesia’s relationship. Department of Konya Belediye as its representative, Ercan Uslu and Selim Yucel Gulec, International Relation Department of Yurtdışı Türkler ve Akraba Topluluklar Başkanlığı (YTB) Servet Turan.